The Digital Research Library of Illinois History Journal™: Belleville, Illinois' Brewery History. Belleville has been known for many industries: stove factories, mills, brick making, carriage manufacturing, coal mining, and breweries. 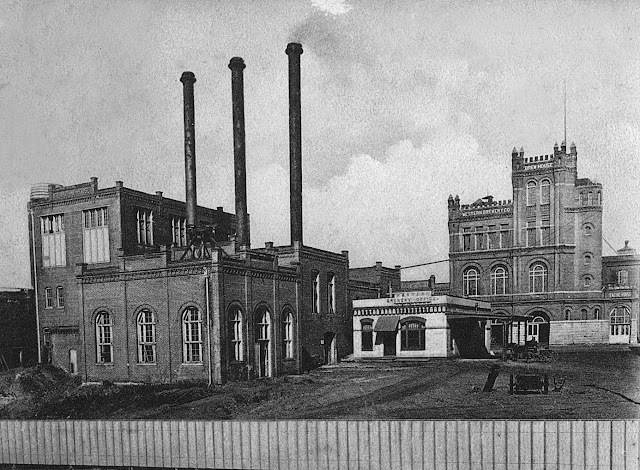 Belleville has had a long history of brewing beer. With the large number of German immigrants who settled in the Belleville area came their cultural tradition of brewing. Western Brewery (Later Stag Beer Brewery) East D Street and North 12th street, Belleville, Illinois. In 1832 Jacob Fleischbein founded the first beer brewery in Illinois. It was built near Belleville's town square. In 1837 Abram Anderson started the second brewery in Belleville. It stood a block south of the present town square on West Washington Street. By 1860 Belleville had seven breweries not including the Fleischbein Brewery, which had closed by 1860. The other breweries were Simon Eimer's Washington Brewery on South Street between Harrison and Lincoln streets, Fidel Stoelzle's on the corner of Main and North Third streets, the Herberer Brothers City Park Brewery on the northeast corner of North Second and West A streets, John Klug's Illinois Brewery on the opposite corner of North Second and West A, Priester and Villinger's Southern, in the fourth block of South Charles Street, and Phillip Neu and Peter Gintz's Brewery in West Belleville. During the 1880s Simon Eimer's Washington Brewery was the largest brewery in Belleville and reputed to be the largest west of the Allegheny Mountains. It had an output of eight thousand barrels annually. Some of the beer was shipped as far away as New Orleans. The brewery was constructed between 1846 and 1847. It occupied a half block and had beer cellars two stories deep. Beer cellars were used to keep beer cold, as refrigeration was not yet available. Fidel Stoelzle built his brewery in 1853. He had to pump water from a spring two blocks away with a twelve-horse-power engine. In those days it was necessary that breweries be built close to a fresh water supply. By the 1880s, his company produced about fifteen thousand barrels annually. He employed twelve men at the height of production. In 1851, when the Neu and Gintz Brewery began operating, it only produced about two thousand barrels for sale in Belleville and East St. Louis. In 1873 the brewery was purchased by an incorporated company, the stock of which was owned by four men: John Kloess, William Branderburger, Adam Gintz, and Valentine Steg. After several building additions, the brewery was producing about twenty thousand barrels a year. The beer was distributed throughout southern Illinois. Later known as Western Brewery, it passed through several different owners until 1912 when Henry Louis Griesedieck bought it. Griesedieck was a member of a famous brewery family. He began brewing beer from an old German recipe that he later called Stag Beer. Production grew to eighty thousand barrels annually, but in 1919 Prohibition halted the brewing of Stag. Neuhoff and Bressler built their brewery near Richland Creek on the outskirts of Belleville. At great expense they built a dam on the creek, and they based their claim for the beer's superior quality on the creek's water. They also established a bottling factory on Main Street. Bressler eventually sold his shares, and the ownership of the brewery passed through many hands until Bernhard Hartmann became sole owner in 1882. He changed the brewery's name to Star Brewery to avoid confusion with previous names. It became the Star Brewery because the symbol on the label was a star. At the time, the brewery produced about twenty-five-thousand barrels of beer and shipped it throughout St. Clair County, southern Illinois, St. Louis, and other points. Those early breweries were very important to Belleville and the surrounding region. Not only did they employ a substantial number of workers, but so did glass and bottling factories located in the town. The local farmers sold their barley, malt, and hops to the breweries. The money earned by these brewers and farmers went back into the community and helped other local businesses. It was not long after the arrival of the German immigrants that they began to establish beer gardens. Beer gardens were important gathering spots. Simon Eimer built Eimer's Hill, a park, next to his brewery. Dances were held there every Sunday evening. Klug's brewery had a summer garden that was used for dances and a theater. The Herberer Brothers Brewery had its beer cellars beneath a large apple orchard. The orchard was used for a park and picnics. The Star Brewery was set in a wooded dell next to a beautiful lake where families gathered on weekends to listen to the German band, play games, and drink Star Beer at their picnics. Those breweries, especially Star and the Griesedieck Western, were important because of their relationships with the town. The officers and members of the boards of directors of the breweries were in a good position to maintain close contact with their fellow citizens, to take part in social and civic life, to keep an eye on unfavorable conditions, and to see that law enforcement was effectively administered. Those men and women often held important positions in the community to fulfill those needs. The breweries were large enough to influence power and control but small enough to work with the public. The brewery business throughout the United States came to an end with Prohibition. Men were laid off, and farmers lost money. Eventually, Prohibition was repealed during the Great Depression. Once more farmers could sell their crops for a profit. Bringing breweries back into business helped reduce the stress of the Depression. Jobs were created, and the need for farm crops increased. After the repeal, two Belleville breweries reopened. In 1935 H. W. Hartmann, son of Bernhard Hartmann, reopened the Star Brewery, creating one hundred jobs and bringing thousands of dollars back into the economy of Belleville. The need for crops helped the farmers of the Belleville area. Early in 1933 the Griesedieck Western Brewery once again produced and sold beer. That first year the company brewed nearly seventy-three thousand barrels, and that number increased annually, especially after 1948. It was in that year that the St. Louis plant facilities opened, increasing both production and sales. By 1954 it was the thirteenth largest brewery in the United States. Employees at the Belleville plant demonstrated their loyalty in a series of events originating in 1954 called "Brag about Belleville and Stag." Unfortunately, in the late 1950s the Star-Peerless Brewery closed. Just a few years later, the Griesedieck Western Brewery transferred ownership to the Carling Brewing Company of Cleveland, Ohio, which had bought the Stag Brewery for $10 million. Carling Brewery owned several plants across the country and produced a number of different brands of beer. Stag Beer continued to be produced in Belleville. The St. Louis plant was changed to produce other Carling labels for sale in the area. In 1979 G. Heileman Brewery of Wisconsin bought Carling Company making Heileman Brewery the fourth largest brewery in America. Eight years later, the Australian brewing giant Bond Corporation Holdings Ltd. merged with Heileman to become the fourth largest brewery in the world. The Stag Brewery in Belleville operated under the Bond/Heilman ownership until August 1988 when it was closed down. It was decided that the Belleville plant could not compete. To remain open, the brewery's facilities needed to be modernized with a sewage pre-treatment plant that would cost $2.9 million. Because the company did not believe it could build the sewage treatment plant at that cost, it closed the plant. Two hundred thirty people were put out of work. At the time of its closing the Stag Brewery was the last beer brewery in Illinois. The next year the United States Environmental Protection Agency sued Heilman for polluting Belleville's sewage system for the previous nine years. The closing of the Stag Brewery sadly ended a 130-year tradition of breweries in Belleville. During their existence, several breweries had helped both Belleville and the surrounding region to grow economically, and they provided a social gathering place, especially for the early German immigrants.